If the Marvel Cinematic Universe has proven anything, it's that not all superheroes need to be dark and gritty, but that hasn't stopped 20th Century Fox from transforming Marvel's Fantastic 4 into the poster child for gloom and doom. 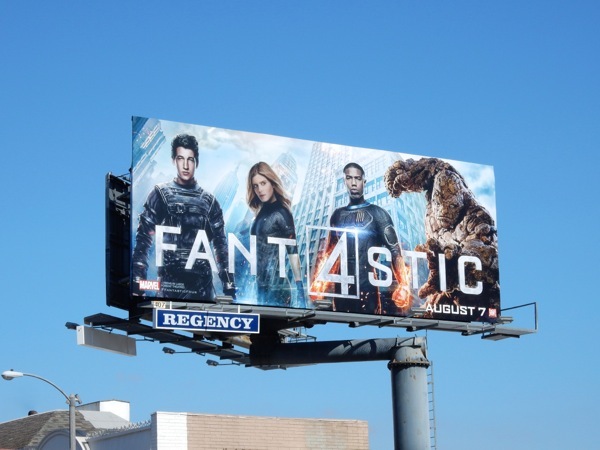 If any comic book adaptation should be fun and full of adventure it should be this quartet of superheroes, so let's hope these billboards for Josh Trank's new reboot of Fantastic 4 are not an indication of how grim and angst-ridden the film will be. 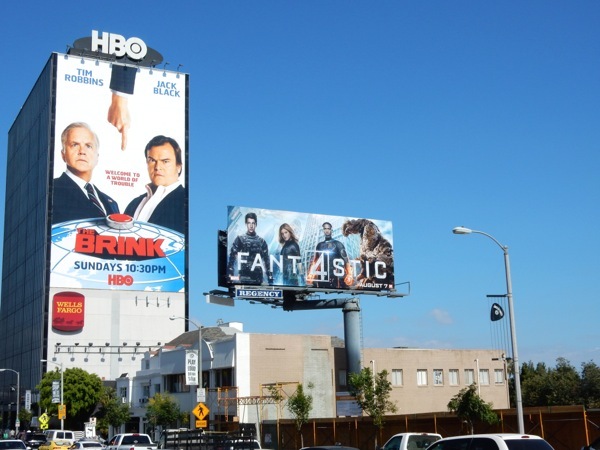 Where's the fantastical in these billboard creatives? Why do we get the traditional superhero pose? 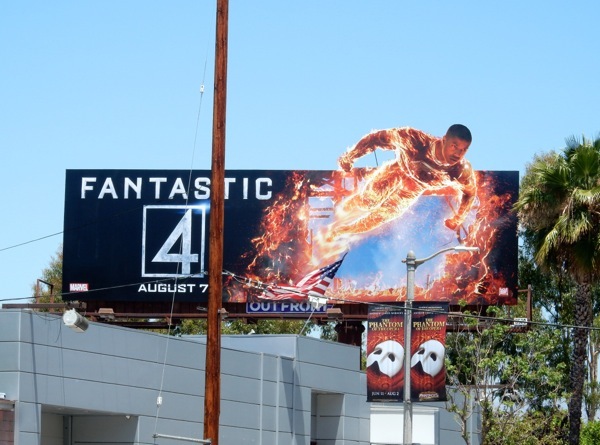 Why isn't 'Johnny Storm' blazing across the sky? Why isn't 'Reed Richards' impossibly stretching his body? The 'Invisible Woman's' power is only hinted at? And most importantly, does the 'Thing' have any trunks on, or not?!? 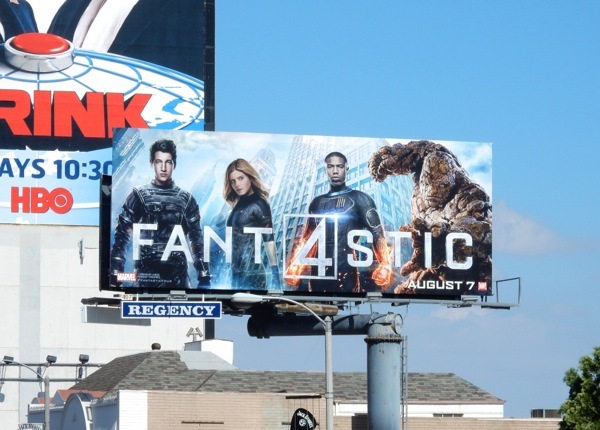 If you're going to reboot a franchise and remake a movie ten years later, then give us something fresh and original to blow our socks off. 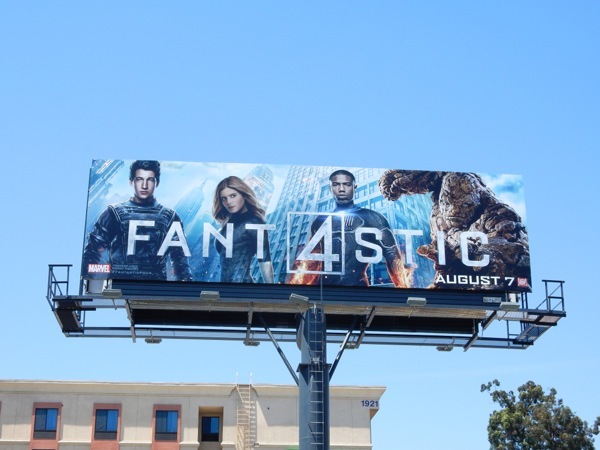 Dazzle and excite us with these billboards. 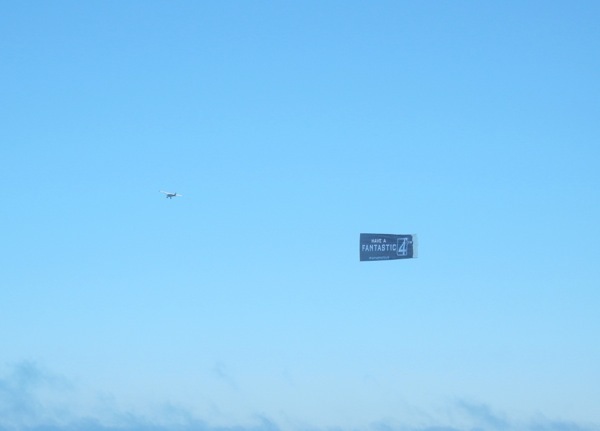 Although this airplane banner for the Fourth of July, snapped over the Pacific Ocean in Santa Monica, was clever, timely marketing. 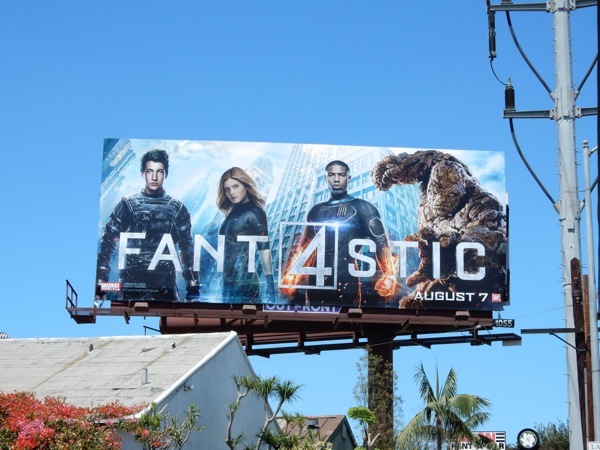 If Daily Billboard seems a tad harsh it's because the superhero movie world is a different place than when the fantastic foursome last graced the big screen, and there's only so many times you can retell an origin story (look at what happened to the rebooted Spider-man franchise). In an ideal world Fox would give these toys back to their original owner, Marvel (for a reasonable price for the rights, of course), and they could join the rest of the Marvel Cinematic Universe as their official first family. 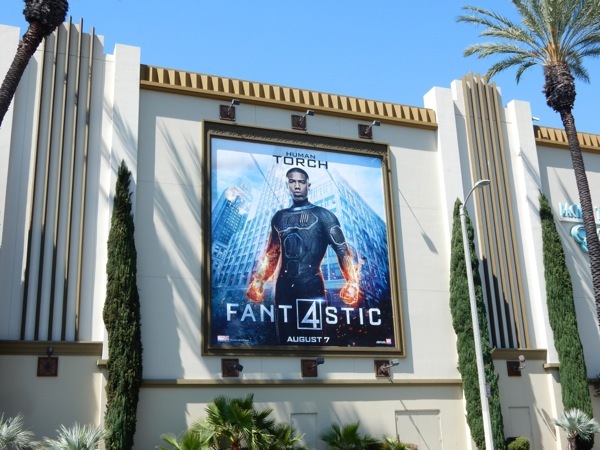 This new film has been surrounded in controversy and negativity from fans since it was announced, from the casting of Michael B. Jordan as a black 'Johnny Storm' aka the 'Human Torch', to reports of the Chronicle director's film being a mess and needing significant reshoots. In this version the team of explorers and 'imaginauts' won't get their fantastic abilities in space from cosmic rays, but instead venturing to an alternate universe will transform the foursome, but from the looks of things they'll still battle their arch-nemisis 'Dr. Doom' (so the more things change, the more they stay the same). 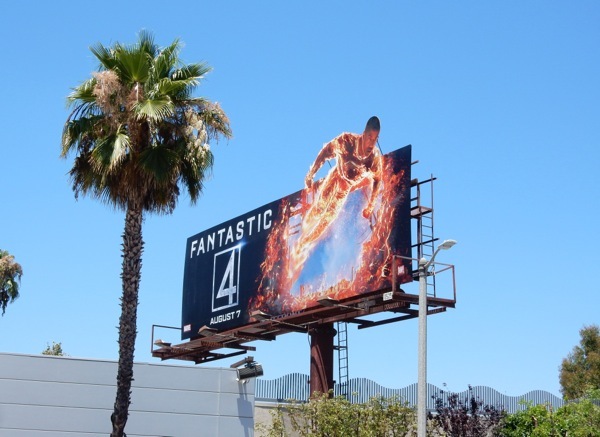 These billboards for the new Fantastic 4 film were photographed around the skies of L.A. from July 2 to July 20, 2015. 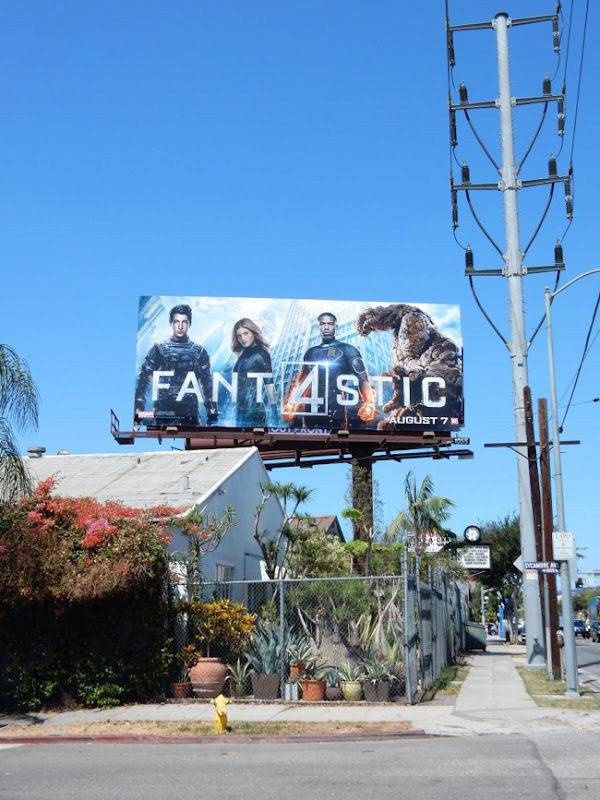 If you're a true believer, be sure to also check out all these other Marvel Comics inspired TV show and movie billboards. 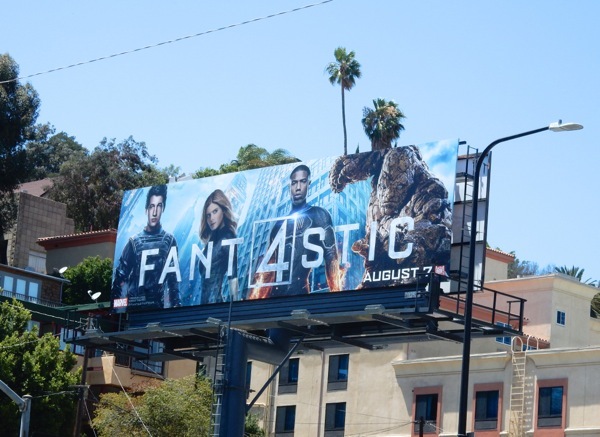 Hopefully this reboot can put all our fears to rest and truly be fantastic, and the spirit of the original comics isn't diminished by the dark tone of the movie. 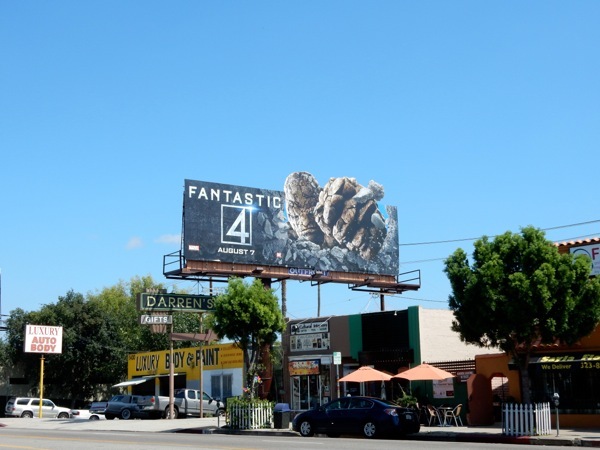 UPDATED: Speak of the devil and Daily Billboard just spied this special extension billboard creative for Fantastic 4 along Ventura Boulevard in Studio City on July 14, 2015. 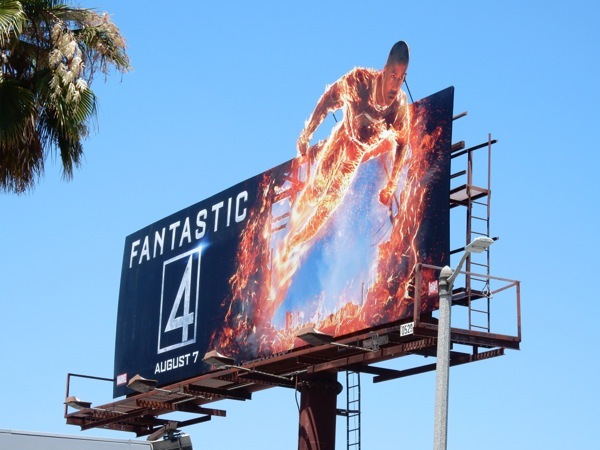 This ad featuring the Human Torch bursting through the burning billboard hoarding is much more of the dramatic spectacle we are looking for. More like this please (and in less obscured locations). 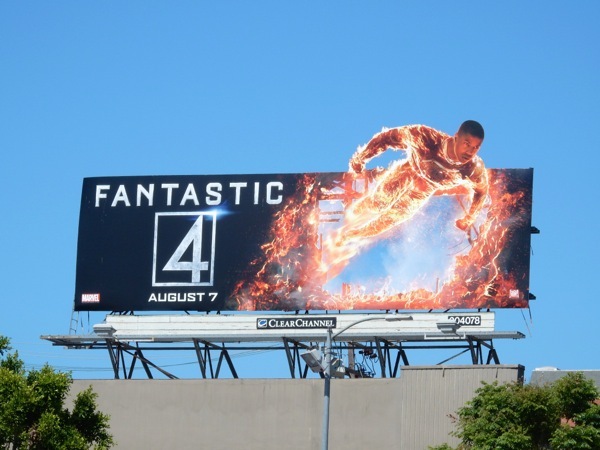 And here's a better view of the special extension billboard featuring the flaming Human Torch, snapped along Pico Boulevard westbound on the way to Fox Studios in L.A. on July 17, 2015. 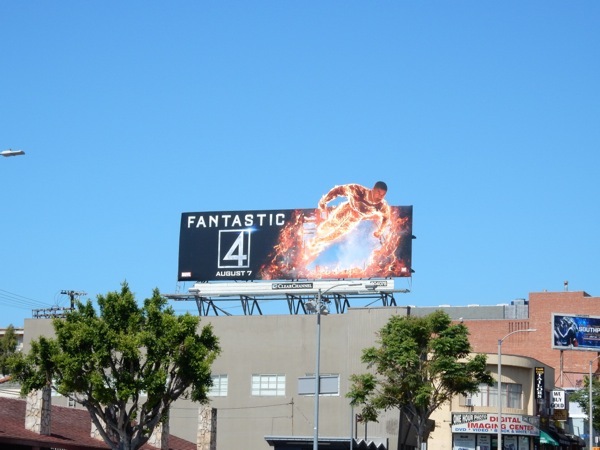 Plus here's another standard billboard with the fiery hero spotted along Westwood Boulevard the same day. 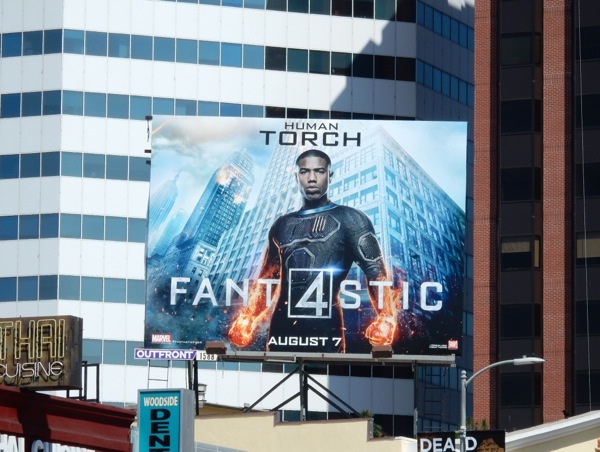 Obviously the Human Torch is the poster child for this movie reboot, so "Flame on!" UPDATED: Move over Torch, by the looks of things "It's clobberin' time! 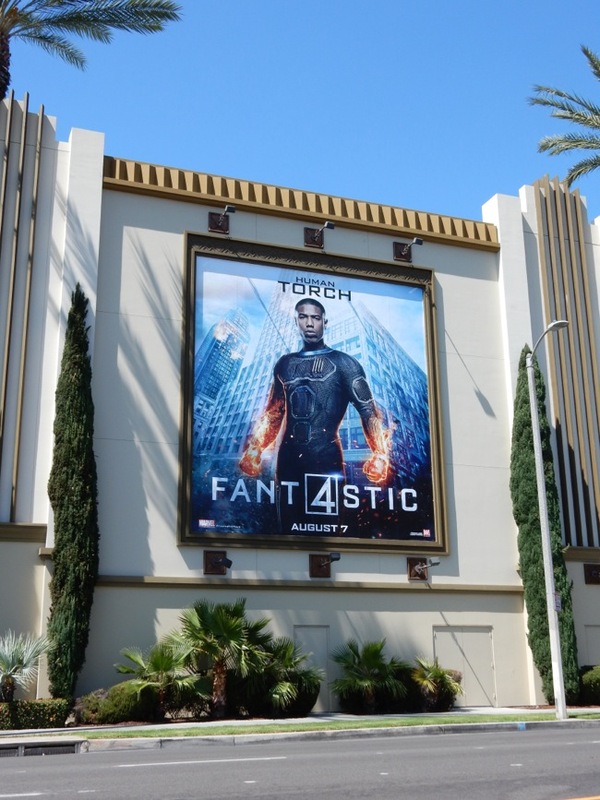 ", courtesy of the FF's ever-lovin' blue-eyed Thing (played by Jamie Bell and a whole lot of CGI in the movie). 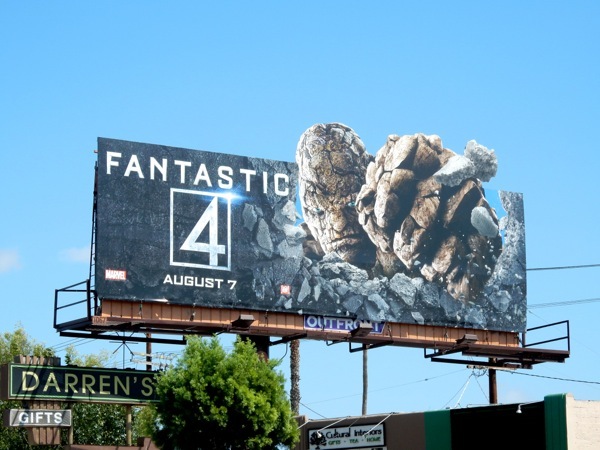 And they don't call him 'Ben Grimm' for nothing, as he looks pretty miserable busting out of this Fantastic 4 billboard snapped along Pico Boulevard on July 21, 2015.